Although some folks may be sad to see summer coming to a close, many gardeners are looking forward to harvesting their sweet potato treasures. Sweet potatoes are warm-season plants that are very sensitive to cold temperatures. The tuberous roots should be harvested by the time frost kills the vines or soon thereafter. Sweet potato roots continue to grow until frost kills the vines. Roots can be left in the ground for a short while; however, a hard frost can cause damage to roots near the surface. Chilling injury also results to roots when soil temperatures drop to 50°F or lower, and this can result in internal decay in storage. The greatest danger from delayed digging is the risk of cold, wet soil encouraging decay of the roots. Depending on how early you were able to plant, you may find an assortment of “baby baker” or smaller roots, as well as full-size potatoes. Although you can cook newly dug sweet potatoes right away, their flavor and storage quality are greatly improved by curing at warm temperatures first. It is during the curing process that starch is converted to sugar. Care should be taken during digging and handling to avoid skinning and bruising the roots. Even a small wound can easily become infected with decay organisms. Line containers with rags or other soft material, if possible, to avoid scratching the roots. Do not store badly injured or diseased roots. 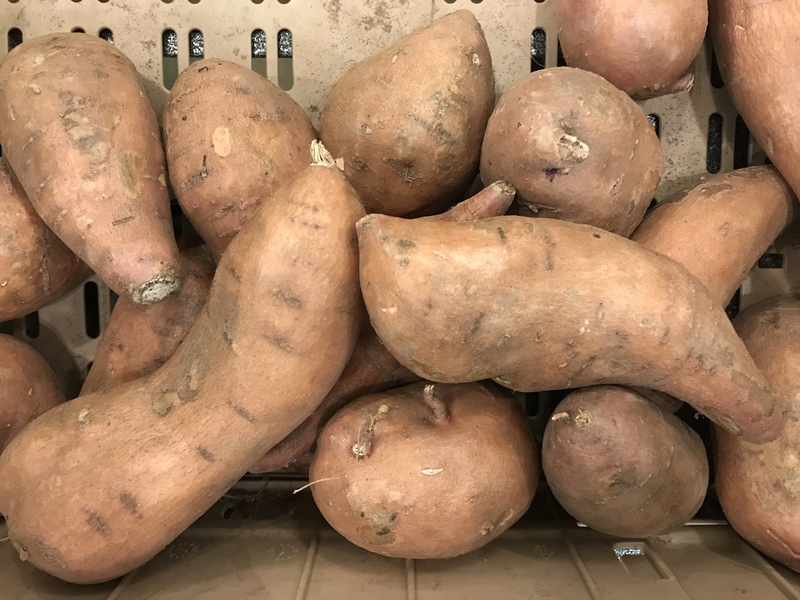 Although large amounts of soil clinging to roots during storage is not desirable, sweet potatoes are easily damaged during the washing process when freshly dug. Allow roots to dry and cure before removing excess soil. Cure sweet potatoes by holding them for about 10 days at 80-85°F and high relative humidity (85-90 percent). In the absence of better facilities, they can be cured between 65-75°F for 2-3 weeks. To maintain the required high humidity (85-90 percent relative humidity), stack storage crates or boxes and cover them with paper or heavy cloth. Packing in perforated plastic bags will also keep humidity high, yet the perforations will allow excess moisture to escape. Once the sweet potatoes are cured, move them to a dark location where a temperature of about 55-60°F can be maintained during storage. Sweet potatoes are subject to chilling injury, so keep them out of the refrigerator. Outdoor pits are not recommended for storage because the dampness encourages decay. Good results can be obtained by wrapping cured sweet potatoes in newspaper and storing them in a cool closet.